Only goal difference separates league leaders Chichester and Newhaven after the Oaklands Park outfit had to settle for a draw in a dramatic match that saw them reduced to ten men for the last 20 minutes. Saltdean had lost three of their past four games coming into the match, where as Chi last suffered defeat in the league in October to Newhaven ten league games ago. The visitors have proved a stern test, though, the past two seasons and were 2-0 winners when the teams last met. Chichester fell behind early on, as they had done in the reverse fixture in September, when Toby House made the most of a piece of good fortune after Jordan Matthews’ clearance ricocheted off Ben Pashley into his path to present the Saltdean striker a pretty simple finish with barely ten minutes played. Two good chances had already come the home side’s way. Scott Jones latched on to a pass from Rob Hutchings following Josh Clack’s cross only for his shot on the turn to lift narrowly over the bar - and then Clack forced a good save out of Nathan Stroomberg. The hosts might have bounced back straight away after conceding but when Jones took the ball down on his chest he couldn’t quite tuck it past the Tigers keeper. City continued to press throughout the half as their well organised opponents sat back, content with the one-goal advantage. Matthews had little to do, although Ryan Warwick got in on the half-hour, but the danger was snuffed out by Matt Axell's timely tackle. Harry Shooman had a shot a minute or so later but it was wide of the mark. Kaleem Haitham came on for Hutchings after the Chi No11 picked up an injury. The home side had two penalty appeals turned down in as many minutes - the second one looked a stonewall shout but Mr O’Reilly wasn’t interested and waved play on. Peake, who had scored the week before against Eastbourne United, then got City back in it in the 39th minute with a goal from close range that Stroomberg could do nothing about. Moments later the Saltdean keeper turned a Clack drive round for a corner after a smart flick from Rory Biggs sent him on his way. On the stroke of half-time Martin curled a set piece just past the post. Chichester almost went ahead following another Martin free-kick after the break but Jones couldn’t get enough power on his header. Dave Herbert picked out Haitham with a lovely pass. Haitham’s first touch might have been better but he found Biggs who got a shot off but it was always rising. Saltdean defenders next had to deal with Haitham’s cross after he combined well with Terrell Lewis down the right flank. Peake was involved again and went close with a header before on a rare Saltdean raid with twenty five to go Curtis Gayler crashed a set piece into the wall and Jamie Brotherton tried his luck from the edge of the box. In three frantic minutes Chi missed a penalty, were reduced to ten men and had Matthews to thank for a fine save when the visitors looked certain to take the lead once more. First Stroomberg went the right way to deny Martin from the spot after the keeper had brought down Jones. Sixty seconds later Martin was off, red carded for a lunge - the sign of frustration perhaps for the penalty miss; before Matthews dived low to his right to somehow get a glove on a well struck effort. The last ten minutes was end to end with neither side able to nick it. Sam Ndlovu went closest for Chi whilst at the other end Saltdean almost made the extra man pay when Gayler blasted a shot over in time added on. City have now drawn three league games this season, all at home. Chi's opponents in their next league game this Saturday, Broadbridge Heath, were one of the sides to come away from Oaklands Park with a point. 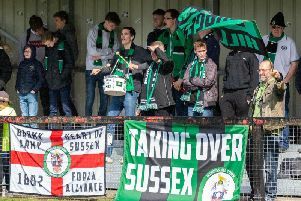 Before that though on Tuesday night RUR Cup holders Chichester are in semi-final action away to Haywards Heath from the Bostik South East league as they look to defend their trophy.